This entry was posted in iPhoneography, Photo Challenge, Photography and tagged Architecture, Curiosity, iPhone 8 Plus, iPhoneography, Old Home, Photography, Windows, Wordless Wednesday. I want to know who that little girl is in the window too. Kind of creepy. Otherworldly kind of way. It’s actually some kind of doll. But VERY creepy! And totally unexpected. Thanks for stopping by Positive Practice Living and linking up! Thanks, Amanda. My friend and I went for a walk when I went back home for a visit this summer. I love the old majestic homes along this street. I just happened to look up and couldn’t believe my eyes! LOL! Thanks, rabirius! At first, I thought my eyes deceived me! LOL! No, but the photo is really wonderful. oh my that is beyond charming!! So true. I think it’s just there all the time. I was there in June! That definitely made me curious! I’m thinking the girl is more like a doll? Definitely a doll — a creepy doll from a distance like that! A bit of a shock! Funny thing is, my friend who has lived in that town all of her life said she had never noticed it before! Funny how when we see things every day we don’t see them as well. Linda that shot is awesome. Eerie, haunting, I love it. Oh my! What a shot! 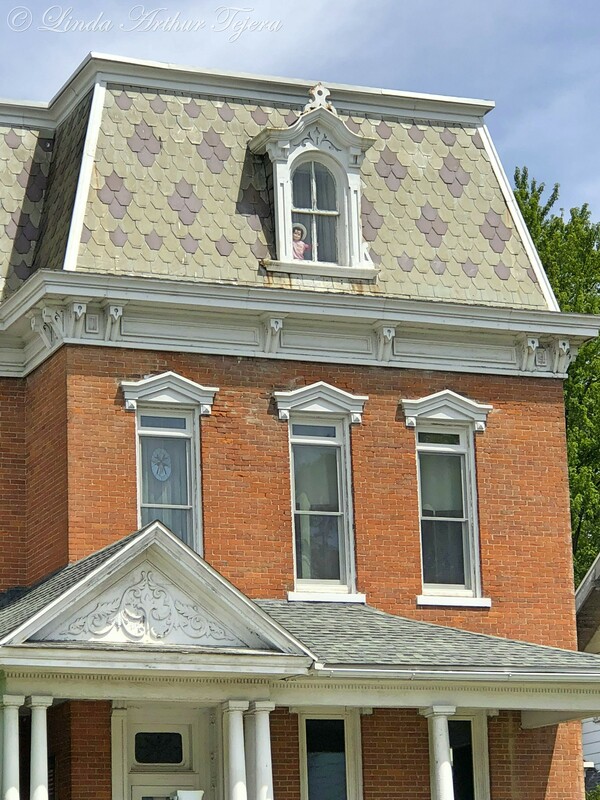 The first time I looked I was too distracted by the decorative portico to even notice the creepy doll staring out the window. What a fantastic photo for so many story prompts. It’s a beautiful old house. But I’m willing to guess that someone is a big Hitchcock fan! LOL! haha!! it’s wonderful even the creepy doll! This picture looks it was taken from a mystery movie. Creepy but awesome! So very true! The funny thing is that my friend I was with has always lived in that town and had never seen it before! LOL! Just saying hello – hope you are enjoying a nice pause…. I have a couple of dolls like that at home, my younger brother hates them don’t know why, im tempted to put one in the window now ready for when he comes home for Christmas hehe.